Indian skipper Rohit Sharma won the toss and decided to bowl first but his decision backfired on his troops as Seifert (84) and Colin Munro (34) wreaked havoc on in-form Indian bowlers. Captain Kane Williamson (34) made a fine contribution as well along with Ross Taylor (23) who fell prey to Bhuvneshwar Kumar's delivery. 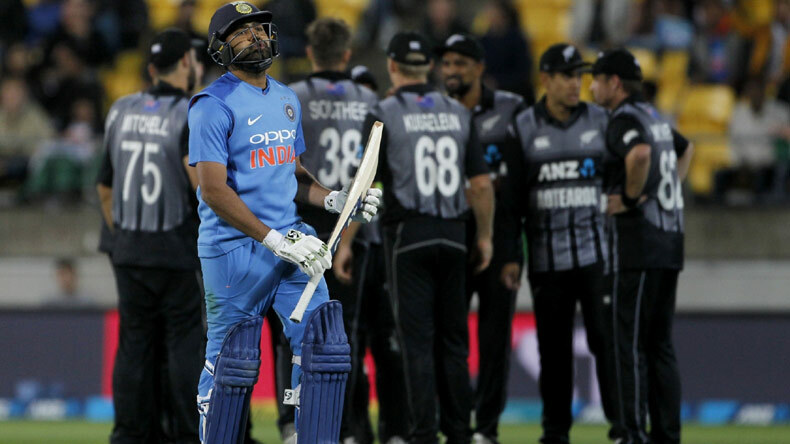 New Zealand destroyed India by securing a resounding 80-run victory in the first T20I played at Westpac Stadium in Wellington on Wednesday. The Black Caps’ wicketkeeper-batsman Tim Seifert led the demolition of Team India with a 43-ball blitzkrieg of 84 runs. He helped New Zealand set a gigantic target of 220 runs and was deservedly named Man of the Match. Chasing the target, Virat Kohli-less India succumbed to the bowling firepower of the Kiwis and were bundled out at 139 runs. Indian skipper Rohit Sharma won the toss and decided to bowl first but his decision backfired on his troops as Seifert (84) and Colin Munro (34) wreaked havoc on in-form Indian bowlers. Captain Kane Williamson (34) made a fine contribution as well along with Ross Taylor (23) who fell prey to Bhuvneshwar Kumar’s delivery. Hardik Pandya bagged the wickets of Daryl Mitchell (8) and Colin de Grandhomme (3). Scott Kuggeleijn helped pile more misery on Indian bowlers by scoring 20 runs off 7 balls in dying overs while Mitchell Santner ended the innings unbeaten at the score of 7. While chasing the monumental target, India suffered an early jolt when Tim Southee sent Rohit Sharma (1) packing in the third over. Shikhar Dhawan (29) tried to stabilise the Indian ship but was clean bowled by Lockie Ferguson in the sixth over. Much was expected from Rishabh Pant (4) but he failed to impress while newbie Vijay Shankar made an estimable effort of 27 runs off 18 balls. The Kiwi bowlers further made it a one-sided contest by sending Indian batsmen back to the pavillion on a consistent basis. Krunal Pandya (20) attempted to get his side into the game along with Mahendra Singh Dhoni (39) but was unlucky as Southee struck again. None of the other Indian batsmen reached a double-figure score and were haplessly bundled out at the score of 139 runs. With the comprehensive victory, New Zealand gained a 1-0 lead in the 3-match T20I series. The second T20I will be played on February 8, Friday, in Auckland.